Although jockey Darryl Bradley was reprimanded for “relaxing his ride”, Ruby Armani (5 m Makfi – Trujillo, by Saint Ballado) further improved on her recent stakes placed second to win the $50,000 Manawatu ITM Anzac (Listed, 1550m) on Anzac Day at Awapuni. Taking his group and listed wins to 99, among 1777 wins, Bradley was only a half head away from what could have been a lengthy suspension if second placed Shadows Cast (Per Incanto) had the bob go his way on the line. After travelling with a lap full of horse, three wide in sixth, Bradley had Ruby Armani ranging to lead around the home turn, finding a one length advantage, but sitting up six strides from the post almost cost the race. It was shades of Opie Bosson aboard Watch Officer (Starjo), then an apprentice in 1998, being beaten a nose by Quasin (Norman Pentaquad) when “dropping his hands” in the Kiwifruit Cup at Tauranga, a mistake that cost him a six-week suspension and $5,000 fine. While fellow riders Danielle Johnson and Mark Du Plessis have also suffered the similar fates. While the Bradley incident gave reason for conjecture, he ended up on the right side of the outcome, and nothing could be taken away from the performance by Ruby Armani. A stakes quality mare in the making, Ruby Armani had gone close to reaching the mantle when finishing second in the Flying Handicap (Listed, 1400m) at the same venue on Easter Saturday. She has now won three times this season and five in total for the B.A.X No. 2 Syndicate managed by Kylie Bax. On footing downgraded to Slow8, Ruby Armani ran the 1550 metres in 1:35.1, last 600m in 36.1, and paid $11.30 & $3.20 on the NZ TAB tote. “Her manners have continued to improve and she’s just getting better with time,” said co-trainer Pam Gerard. “With that maturity she has strengthened and now copes with some cut in the ground, and looks like she’ll get a mile. Her work on Saturday morning was outstanding and drawing out a bit enabled getting to a better part of the track. 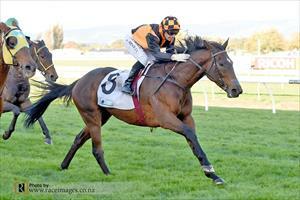 “She seems to like the track at Awapuni – horses for courses. Last start was her first trip away and it was all a bit new for her, but this time she ate everything and couldn’t care less. So, she’s getting better and not sure now whether or not she’ll spell? “She’s going well and while that’s the case we might keep ticking her over and see what races are available for her and what the track conditions are like. The track wasn’t too bad today and she’s been pretty good on dead ground, but when it packs up and becomes heavy, who knows? We’ll have to wait and see. Ruby Armani was strapped by Richie Fallon.